There was an earthquake around the Hindu Kush mountain(兴都库什山脉) this week. The earthquake went to Afghanistan(阿富汗), Pakistan, India and Tajikistan(塔吉克斯坦). Over 100 people died from the earthquake in Afghanistan, and the number of the dead is still going up. 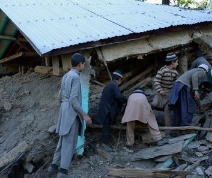 In a school in Afghanistan, students were having classes when the earthquake began. Then all the students ran out of the classrooms to the open air. They were so frightened that they were crying and pushing others in the running. Many students fell to the ground and could not stand up, because others were all running on their bodies. At least 12 girls died under others’ feet in the running. 1. A(n)______made a lot of people die in Afghanistan. 2. The earthquake didn’t happen in _______. 3. The students were______when the earthquake happened. 4. The underlined word “frightened” means_______in Chinese. 5. Which is RIGHT when an earthquake happens? C Running to the open air. D Standing by a wall.